This book is a selection of the life history of Sufi saints, their teachings and thoughts. The main object of this book is to give an opportunity of spiritual benefit and spiritual purification to those who are inclined to follow the simplicity of Sufi's lives, their advice and teachings. It is not limited to particular faith, but persons of all faiths can be benefited by them. 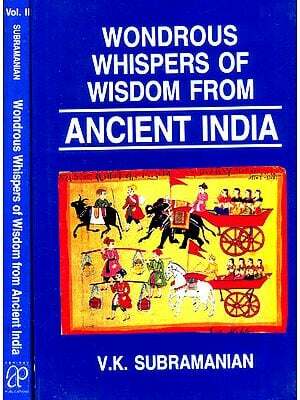 This book PEARLS OF WISDOM depicts the Sufi thoughts. The great Sufis from the early period of Islam, till the beginning of this century, have influenced the thinking of the common man, inculcating in them piety, religious tolerance, patience, charity, simplicity, humbleness and many other good qualities which make this world worth living. To create intarest of the readers, a short life-history of the great Sufis is incorporated. In making the present selection of names of the Sufis, in this book, I have indulged in the generosity of my critics. 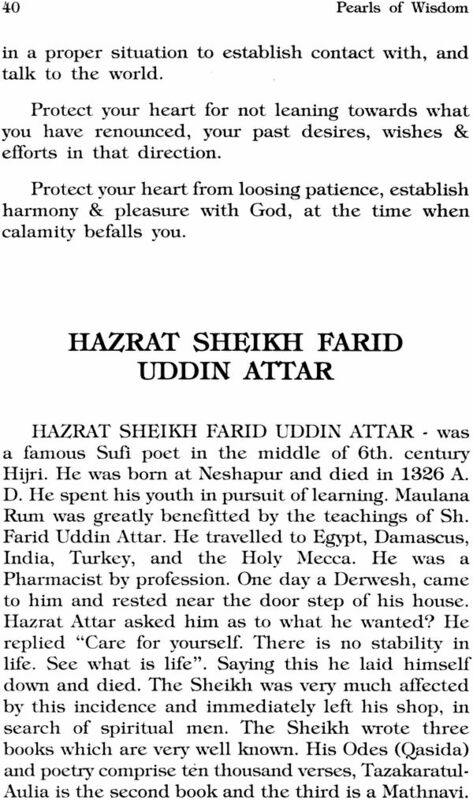 No doubt, there were other great Sufis whose names are not included in this book and their sayings as well. After all, this is the first edition & an humble attempt on my part. Insha Alla, names of other great Sufis will be included in subsequent edition, according to the valuable suggestions of readers of this book. Their period and the country to which they belonged is noted, although their teachings have been universal. According to the dates of birth and death, where available, their names are noted in this book, more-or-less in a chronological order. Three main characters of Sufis exist in the Persian word "FIQR". F stands for "Faqa", means "Fasting", I is silent in the word, Q stands for "Qinayat", which means "Patience" and R stands for "Riyaz" which depicts prolonged hours of worship (of God), more than what is required in following "Shariat". 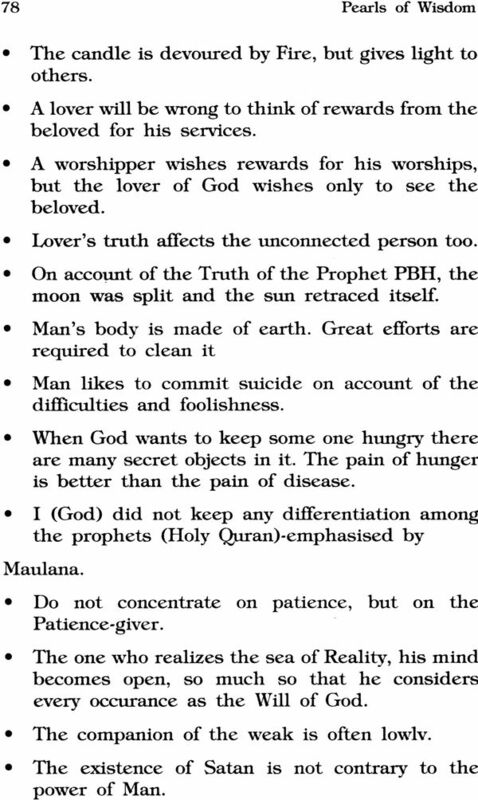 The Prophet Mohammad PBR had mystical awareness. Re had mystical experience of a Super-Natural Presence. As such Sufism can be traced back to the time of the Prophet PBR. It is said that Prophet Mohammad PBR invested Hazrat Ali with a cloak (Kharqa) and initiated him in the esoteric mysteries, imparting him spiritual wisdom, which is beyond all formal worldly learning. Hazrat Ali too is considered as the first great Sufi. They followed the principles of "FIQR". The Sufis were mainly guided by the Holy Quran, Hadith and the practices of Sahaba (contemporaries of the Prophet PBH) Tabaeen (contemporaries of Sahaba), Taba-Tabaeen (contemporaries of Tabaeen). Sufism is thus a developed culture based on deep religious knowledge (Urn) and practice (Amal). But according to Hazrat Kh. Moin Uddin Chisti, Sufism, is neither knowledge alone, or form alone. 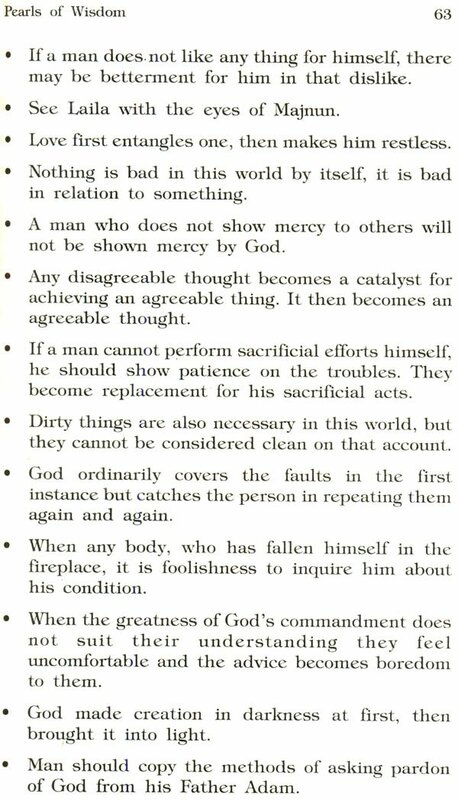 It is the Ethical Discipline of Mystics. Knowledge (Ilrn) is acquired through the physical efforts of eyes and ears, or through intuition (divine) - "Ilham". The Prophets acquired knowledge directly from behind the veil (hidden God) through angel or through manifestation of God in shape or form, as in the case of Moses. 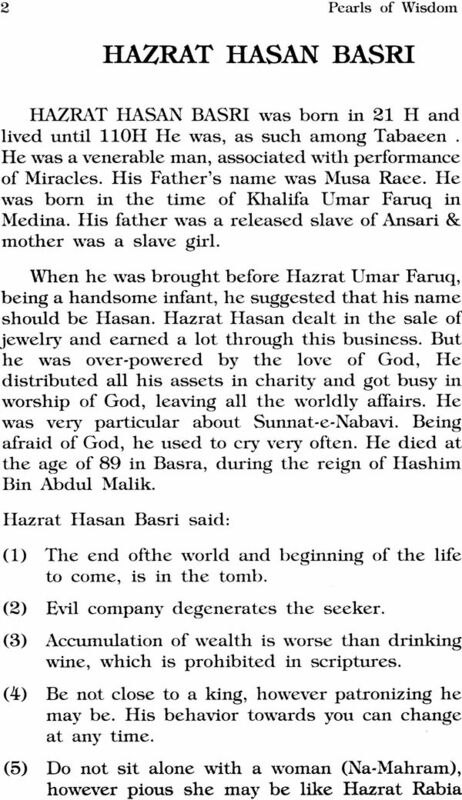 This in fact is Gnosis-Maarfat, of the Reality (Haqiqat). In their teachings to the followers, the Sufis referred many a times to the Holy Quran and Hadith. By and large Sufis did follow strictly Shariat, which means formal laws of Islam. The other method of worship is called Tariqat, which means Path, the Ethical Discipline and which emphasized meditation and Sama-audition of religious music. Sama is part of the method of worship of the Chistia sect, though not practiced in the Qadaria section, an equally important section of Sufism. The Chistia sect was introduced in the Indian subcontinent by Hazrat Moin Uddin Chisti, who finally migrated to Ajmere. Chisht is a village near Hirat (Khurasan, in medieval period). Sama has an Exoteric aspect and an Esoteric aspect. The exoteric aspect applies to common people and novices. It is mainly dependent on the musical instruments and poetry. In case of the Sufis of Chistia Sect, it is the Esoteric aspect of Sama, which plays a significant role in worship. It becomes a source of Ecstasy (Wajd), in which they may dance in a typical Sufi way or may even tear their garments. They loose self control, in the latter condition. There are other important sects like Naqshbandia and Suhrwardia with their own originalities in their practices. It will not be out of place to mention that, the word Sufi has originated from the word Sufva, which means wool, as the Sufis generally dressed themselves in woolen overalls. Others think that the origin is from "Ahl Safva", that pious group of persons who used to sit on a low platform in Masjid Nabavi from the time of Prophet (PEH). This was a group of humble, pious, patient and poor persons. Such persons still occupy, generally during prayer time a platform behind the grave of the Prophet (PBH) and his companions Hazrat Abu Bakr Siddiq, (RAA) and Hazrat Umar (RAA) - the first two Khalifas. The Sufis have grades, like Salik, Qutub, Majzub, Wali and others and perform assigned spiritual duties accordingly. Sufism influenced Arabia, Iraq, Iran, Asia Minor and the Indian sub-continent and wherever Islam spread out. Persia made outstanding contribu- tions to Sufism. The political renaissance of Persia under the 10th Century dynasties of Suffarids & Samanids brought the revival of the Persian language. The earliest Persian book on Sufism is said to be "Kashful- Mahjub", written by Hazrat Ali Abul Hasaan Hajweri- Data Sahab, who ultimately settled in Lahore, at the instruction of his "Pir". The concept of Sufism is based on two theories: (1) Hama Ost i.e. God exists in everything and, (2) Az Hama Ost i.e. every thing is from God. The other division of Sufls is based on the concept of (a) WAHDATUL-WUJUD, which means UNITY OF BE- INGS, and (b) WAHDA11JL SHAHUD, which means Unity of Witnesses. The object of this book is to give an opportunity of spiritual benefit and spiritual purification to those who are inclined to follow the simplicity of Sufi's lives, their advice and teachings. It is not limited to persons of a particular faith, but persons of all faiths can be benefited by them. True spiritualism is as rare these days as Philosopher-stone. Yet the Prophet Mohammad PBH said that "Mercy descends at the mention of the Pious". Some people appeared before Imam Yusuf Hamadani, and requested him to let them know, as to what should be done when Saints have left this world and passed away. He advised them to read eight pages of their sayings every day. As a matter of fact, in India, Islam spread by the teachings of these great Sufis of the subcontinent and not by influence of sword, or patronizing or pressurizing by the ruling Muslim kings, some of whom did not follow the teachings of Islam strictly. 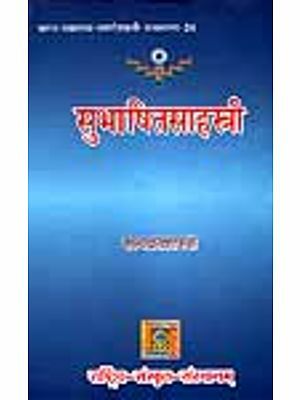 Though this book was started with the main idea to emphasize the teachings of Maulana Rum, as depicted in his verses of the Mathnavi, containing over two thousand verses. The Mathnavi is so concise and full of Islamic teachings that it has been referred by some, as the Holy Quran in Persian language, though it is not a translation of the Holy Quran at all. 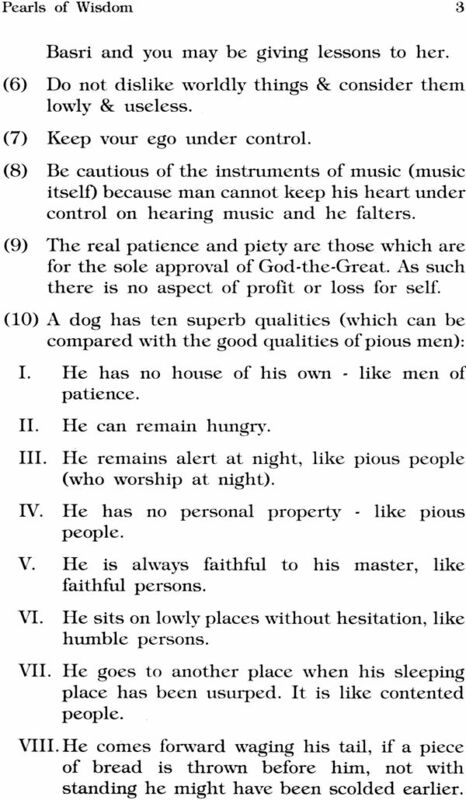 But the teachings of Sufi Shah Bu Ali Qualander of Panipat are also included in some details. 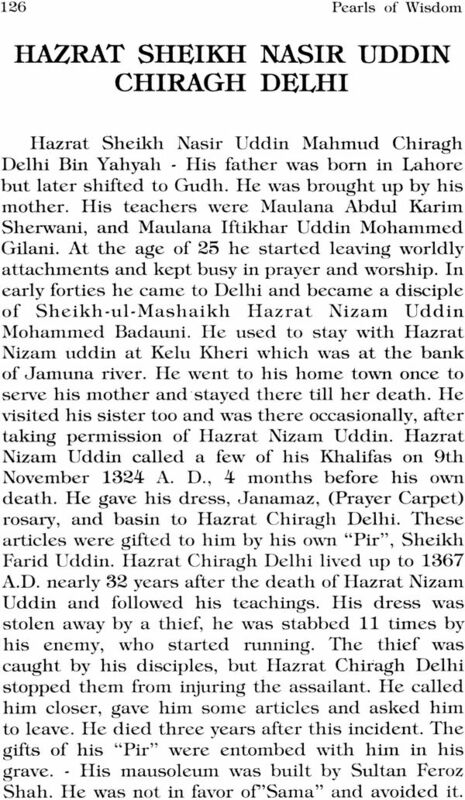 He was contemporary of Hazrat Nizamuddim Aulia. 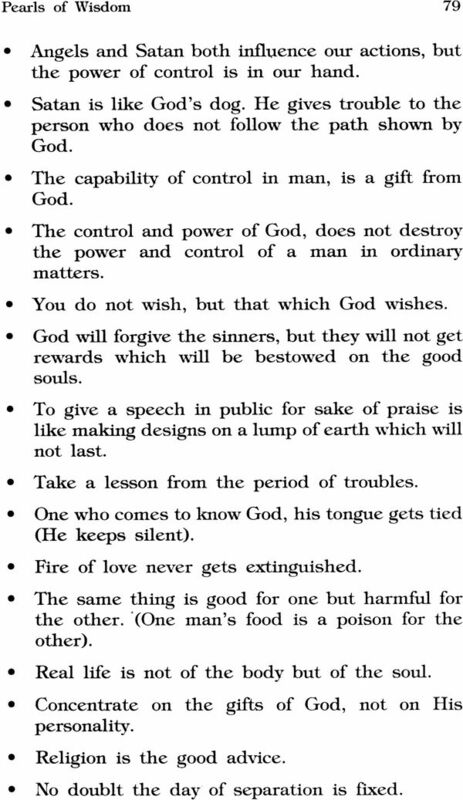 The sayings of earlier Sufis of Arabia, Iraq and Iran are noted in brief. I wish and pray that the book, Pearls of Wisdom may benefit and guide us all in our worldly and spiritual life. Amen. For the sake of brevity, certain abbreviations have been used in the text, such as "H" stands for HAZRAT, M. for Maulana, H against numbers stands for Hijri, H against a saying stands for Hadith and Q against a saying stands for the Holy Quran, Sh. stands for SHEIKH PBH for Peace be on Him, RAA for Razi Allaho Anho which means God approved him. My thanks are due to Ms. Linda Gless who worked hard in typing and recording this book on a computer. I am thankful to all those persons who took interest in reading proofs of this book. I cannot fail to mention in this conection the names of Mr. Yamin Uddin Haqqi of Lahore and Ms. Kaneez Fatrna Khan of Kanpur. Both of them took great interest in reading the manuscript and giving their valuable suggestions. 5 HAZRAT MALIK IBN DINAR AL SAN!